Last night, I attended an event with a friend who works for Kimpton Hotels. She had asked me a few weeks ago to accompany her to the annual Kimpton Bingo night at the Hotel Monaco in Penn Quarter, DC. When I RSVP’d that I would attend the event, I wasn’t quite sure what to expect from the night, but I’m generally up for (almost) anything. I invited a couple more girlfriends, and we made it a night. What a night it was. Kimpton knows how to throw a party! When I arrived at the Hotel Monaco, which is located inside a National Historic Landmark, neoclassical General Post Office building constructed in 1839, there was someone waiting right inside the main door to direct me to the fourth floor Paris Ballroom where Bingo would be held. I made my way through the beautifully decorated lobby, where wine hour was being enjoyed by hotel guests, to the elevator; taking note of the historical faces on the wall paper that lined certain hallways. 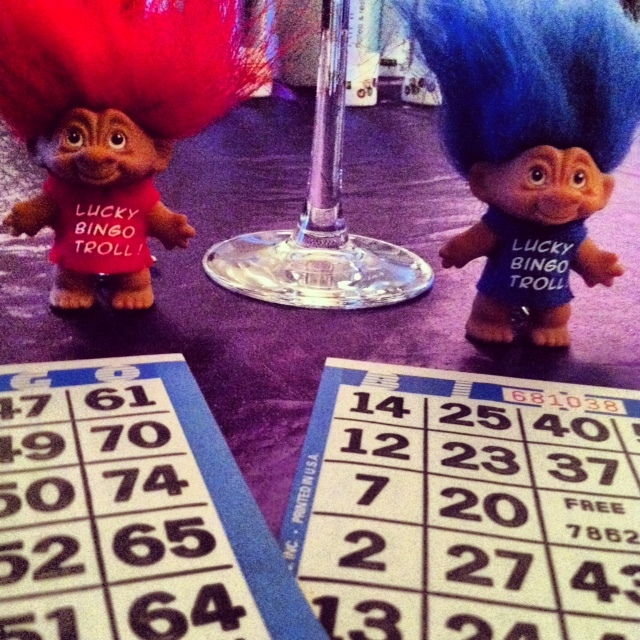 When I arrived at the ballroom, there were plenty of smiling Kimpton staff members standing proud, anxious to greet me and give me a warm welcome, check me in, and hand me a tiny “good luck” troll for my Bingo game. Lucky trolls, nice touch folks. Waiting by the door was yet another surprise. DC’s very finest drag queen, Channel, was patiently standing by the door in all her glamour to greet guests and pose for photos. If you live in the DC area, make your way over to Nellie’s at some point for drag brunch and say hi to Channel. She is stunning! The ballroom was set up with several open bars and food stations, operated by some of the most delicious restaurants in DC. We were able to sample dishes from places such as: Urbana, Poste, and Zentan; such great DC eateries in one ballroom. Again, well done, Kimpton. The night continued on and Bingo began. Trivia questions for additional prizes speckled the moments in between Bingo games, and of course, Channel provided her own entertainment in the form of wardrobe changes, lip-syncing to Pink and “Call Me Maybe,” as well as her inappropriately sexualized calling of the Bingo numbers. The bars remained open throughout the night, as did the food stations and fun. While I can sadly admit that I did not win one of the many Bingo games, it did seem very exciting for those who did. Prizes included multiple night stays at several different Kimpton properties across the country and even a swanky Kimpton bathrobe for one lucky winner. The night was definitely not a total loss for those of us without big prizes. We did get to enjoy top-notch food and drinks throughout the evening, as well as full dessert plates complete with chocolate covered strawberries brought to our table as the night came to a close. What service! I give Kimpton two thumbs up for a good time at the historic Hotel Monaco on a cold Thursday night in March here in DC. I look forward to enjoying many more events as a guest of this fun-loving company.